Elf Quest’s 35th Anniversary was celebrated at WonderCon 2013 last Saturday. The team that comprises the custodians of the 35 year old comic fantasy adventure did not disappoint fans with their talks of what’s next for the legendary brand. Here’s a taste of what happened and selected picts and Twitter tweets. Thorpe and Rhodes recently hit the front page of Variety when they acquired the film/TV rights to the “ElfQuest” franchise. They first gained attention for their award-winning cyber-phenom “ElfQuest: A Fan Imagining”, a short live-action production which has gained over 300,000 views since its debut, earning numerous awards and accolades from film festivals, conventions and the media with over 100 articles and interviews to date. In addition, as a founding member of The League of Extraordinary Ladies (LxL), Thorpe joined her geek girl friends for an energetic panel sharing tips and creative insights into the geek world. Originally formed by a small, but fierce group of geek girls, LxL has become a world-wide community fostering connections with like-minded ladies and creating a safe space online for discussions, sharing and more. 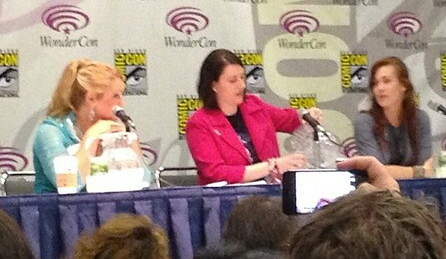 Be the first to comment on "Elf Quest 35th Anniversary Panel At WonderCon 2013: Picts & Tweets"